These games are played for fun or, more often, for a small bet, either in practice, on non-match days, or after games between players. 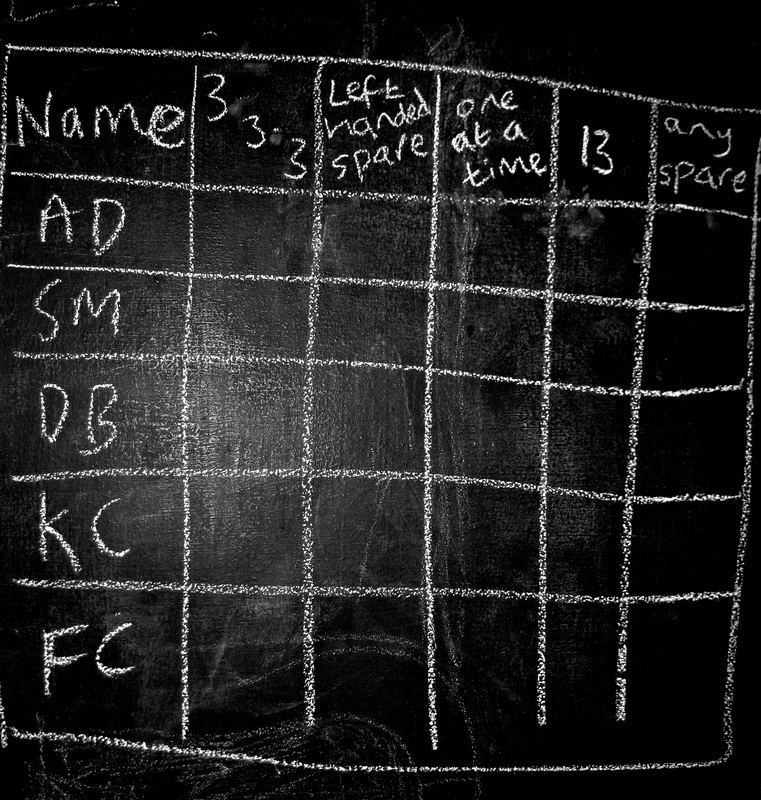 Marking or scoring of these various games can be done either on the blackboard, or on the skittles boards themselves, and is often done by players who are waiting to play. This is the same as the game played in normal league matches, but is only played between two individuals, or two pairs, and usually consists of a one-off game of 91 down. Sometimes a ‘best of three’ will be played, but usually pressure on the board (other players wanting to play) keeps the games short. In these games, everyone always has level throws. In the event of a tie, players throw ‘three balls’ each (ie as in the normal visit to the board). This is commonly known as a ‘three-baller’. The highest score with those three balls wins, and in the event of a further tie, three more balls are thrown each until a winner is found. Sometimes, players may decide to throw more of the bet in, and play a second 91 down instead; this is effectively ‘double or quits’. This is usually played for small bets, perhaps 20p or 50p, but can rise higher if serious players are playing and a lot of beer has been consumed. Killer is a simple game for as many players as want to play. Each player’s name is written on the board, one beneath the other, either in alphabetical order, by age (‘oldabetical’), randomly, or by writing names on a bit of paper or on beer mats and drawing them out. Each player is given three 'lives', written as in roman numerals by three vertical lines, and then each player takes it in turn to visit the board and throw three balls. The object of the game is to score more than the player who comes before you, so if the first player scores nine, the second has to get a spare and score at least ten to avoid losing a life. It is in his interests to score as many as he can to increase the chances of taking a life off the next player. When the last player listed has played, the first player plays again, following that score, and so on. Scoring less than the previous score loses a life, and one of the three lives is crossed off. When all three lives are lost, the player is out, and the person who was following him now follows the preceding player. This continues until there is only one player left. Usually, but not universally in all pubs, the player who goes first has to get a spare to save a life on the first throw of the game, since they do not have anyone else to follow until their second time around and would otherwise gain an advantage. Teams or pubs who do not expect a good player generally to get a spare do not play this rule and often do not ‘give the odd one’ either. This simply involves the players involved all throwing three balls – the highest score wins and takes the money. If two players tie, then they and only they throw again – ie play off against each other – to see who wins. Named after one of the pubs in the league, this has players’ names written on the board as with Killer, but without lives. The order of play is irrelevant here because the aim is simply to have the highest score of everyone who plays. Everyone throws three balls and the highest score wins. The nice twist here is that if there is a tie, everyone is 'back in' (‘all back in’ is the shout) – the game begins at zero for all. If this is being played for a bet, this normally reduces for the second round and all subsequent rounds, so if everyone put 20p in the first time, after a tie, it would be 10p and continue to be 10p for every tied round until a winner was found. A new game would then start at 20p again. Fives and Threes is much simpler to play than it is to explain. It begins with the names of the players written on the board as above, and with each player taking it in turns to have three throws as usual. What is different is that the only way to score is to finish with a score which is a combination of five or three. All three balls must be used and a miss voids the throw altogether – every ball must hit at least one pin to count. A final score of three would thus involve hitting one pin only with each of the three balls. A score of nine could start with any number from one up to seven, as long as something is scored with each ball thrown. The score is then divided by 5 and 3 to see how it scores, with each division gaining a mark or ‘hole’. A final score of three scores one mark (1x3); five scores one mark (1x5); six scores two marks (2x3); nine scores three marks (3x3); ten scores two marks (2x5); twelve scores four marks (3x4); fifteen scores eight marks (5x3 + 3x5); eighteen scores six marks (3x6); twenty scores four marks (4x5); twenty one scores seven marks (3x7); twenty four scores eight marks (8x3); twenty five scores five marks (5x5); and twenty seven scores nine marks (9x3). This game is unusual in several respects, then. First, because it is not the highest score that is the best; and secondly because all balls must count. A player who gets 15 in his first two balls must score three more with his last ball to get a score – albeit a worse one than if he had got fifteen with all three balls! This game scores more slowly than traditional games, and therefore starts at 21-down. But as usual, the exact score must be reached at the end, so a player who has scored thirteen so far is in a better position than a player who has scored fourteen, because he only needs fifteen (gaining 8 holes, and reaching 21) to get out, whereas the player on fourteen needs twenty-one (gaining 7 holes and reaching 21). As with all these variations, level throws applies. If two players get out at the same time, they and they alone play off, seeing who can score the most – on fives and threes scoring – from three balls. A kind of solitaire of skittles, this is really for individual practice. A player simply attempts to knock all nine skittles down, one at a time, with no misses. It’s not half as easy as it sounds. This can be played as a competition. Players start at 21-down, as with fives and threes, and see how many they can score going one at a time. A player continues throwing, even past nine (setting them all up again) until he misses or knocks more than one pin over, when it becomes the next players turn. Level throws applies. This is a game of variations. All the players’ names are written on the board, having been chosen at random, and lines are drawn down the board to indicate which game is to be played each time, with one game chosen by each player, in turn. In the image below, AD chose 3-3-3, SM chose a left-handed spare (right handed for left-handers, obviously), DB chose one a time, and so on. The games chosen by each player can be almost anything; either something they think they excel at, or something they think will test everyone: it might be ‘8 one ball’ – meaning that you have just one throw and you have to get 8 pins with it. It might be ‘any spare’ – getting nine with two balls. It might be ‘3x3’ – meaning that the player has to get three with the first ball, three with the second and three with the third. It might be getting 5 with 2 balls, or 3x1, or a twelve spare, or 14, or ‘one and one’ as above, or any variation that the player decides. This is scored in an ingenious way. Every player starts with two hundred points, or two thousand - in short, some large, arbitrary number - and their score is ‘halved’ every time the player fails to get the required score – which is common, given the obscure and bizarre range of choices available, and the aim of the game, which is fun. On the board above, therefore, if the score started at 200, and AD failed to get the Game 1 score, 100 would be written next to his name, in that column. His next score for failure would be 50, then 25, then 13 (scores are rounded-up), 7,4,2,1…and out. If, however, a player gets the score required in the game, 10 is added to his score. So if DB, in the board above, got all nine, three-at-a-time, in three balls (Game 1’s score), then 210 would be written next to his name. This scoring is ingenious, because it seems now as if DB, on 210, is so far ahead of AD on 100, and that he must win. But consider the case if AD gets Game 2 (a left-handed spare) and DB doesn’t: AD adds 10 to 100, totalling 110; DB halves 210, leaving 105. AD is back in the lead! As an incentive, the 10 awarded to anyone getting the Game score is doubled to 20 if the Game was suggested by that person themselves - if it is their ‘own’ game. This ‘Brucie Bonus’ makes choosing something you can do and others can’t, a definite recipe for success. It also helps to have your favoured games come near the end, as the scoring changes winning and losing positions with remarkable ease, so it is essential that the playing order is decided by chance (as detailed above). The most recently introduced of all these games, this involves taking a pack of cards, shuffling them, and placing them face down on the table. The players’ names are written in any order on the board with three lives next to each name. The first player turns over the first card and has to get the score given on the card. He must get the score exactly, with no misses, using all three balls, to save a life. The only exceptions are for an ace, where the player has a choice of getting one pin with one ball, or eleven with all three (handy if you bust the first throw), and two, where he must get two pins with two balls. A jack counts as eleven, a queen twelve and a king thirteen. When the pack is exhausted, begin again. The last player with a life is the winner. If a player or a team is playing a game in which the participants have level throws, they are entitled to make as many visits to the table as their opponent(s) in that game. Skittles etiquette rules that if someone else marks (scores) the game for the pair or pairs that are playing, they get to play the winners, with the losers having the option of marking the next game themselves, unless others have been waiting to mark. Most skittles tables have a scoring board attached to end of them, rather like a cribbage board, which consists of four rows (one up and one back for each player) of either 45 or thirty holes. These holes are filled in with little metal pegs or matchsticks, as a way of counting the scores. An extra one hole is at the end of each pair of rows to mark the odd pin which all games have (21 down, 31 down, 91 down). Often in friendly competition, players will ‘give the odd one’ – meaning, when a player has eight one ball (knocks down eight skittles with one ball) or eight from two balls, the last one is given, and doesn’t have to be played for, yet is counted on the scoreboard. This is given because it is expected that a good player will always be able to get the odd one; but the rule has given rise to furious debate within the Mendip league, with two different traditions of the rules existing. One version suggests that the player can ‘take’ (ie accept being awarded the point despite not having thrown) the odd one or not, as he chooses. So if getting eight after two throws would leave a nice out – say five, rather than the four which nine would leave, he is entitled not to take it and choose to throw the last ball away. The other tradition says that you must take it, even if scoring nine is worse for you, because you have been ‘given’ it all night. When players from different pubs and different traditions play each other in friendly games, this can result in some argument, which no-one has yet found a way of resolving!